In this article Dermot Campbell, CEO, of Kuber Ventures and Andrew Kartashov, Director of Kuber Ventures, explore how best to manage and mitigate the risk of your EIS portfolio, whilst not compromising performance. Kuber Ventures is not an advisory company and you must seek professional advice before investing in high risk assets such as EIS or SEIS. Whilst ignored here, stock selection is critical when it comes to private company. When investing in private companies, due diligence is key and an experienced investment manager will do this for you. In this article, we assume that you have chosen managers who are good at stock selection and are focusing on what you can do to optimizethe performance of your portfolio. 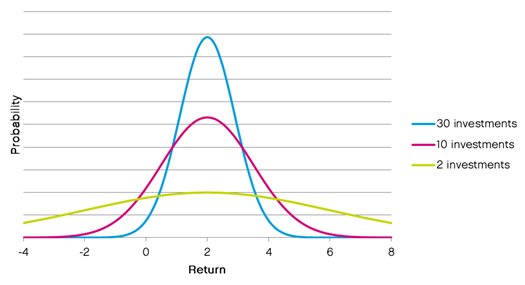 Diversifying a portfolio reduces the standard deviation which means that the results are more predictable. The chart below illustrates the effect diversification has on a portfolio. The idea behind EIS and SEIS investments is that the government compensates you for the risk you take. The so-called “low risk EIS” will tend to exit sooner, however, the returns are likely to be materially lower. The reasons are simple; with EIS you get tax relief on your losses and tax free gains which amplifies the risk: reward ratio. Many investment managers don’t like to talk about the idea that one of their investments could fail, however, failure of some individual investments in a portfolio is a fact of life.The key is that you want to maximize your chances of getting a collection of successful investments in your portfolio. If you by lots of investments, you will be compensated for any losses on poor performers and the out performers will return tax free gains. So let’s have a look at some likely scenarios and numbers within and the likely impact of loss relief. An individualinvested in SEIS with 50% income tax relief (with relief used in full). Delivers a return of 10% per annum for 4 years equates to +46% total return. * The figures for 45% are better still. These numbers can be changed – please contact us if you would like to receive the financial model, which will enable you to amend the figures used in order to match your personal circumstances more closely. Further examples are provided at the end of this article. The Average return is 46% (10% p.a.). In total it is 18% p.a. as incometax relief of 50% nearly doubles thereturn, delivering 18.32% vs 10% So it is definitely very positive. An individual invested in SEIS with 50% income tax relief (with relief used in full). We get exactly the same result, +18.32% per year, and since none of the companies failed, we didn’t use loss relief. The difference is, in case of a diversified portfolio,is that the deviation of your returns will be lower so you are much more likely to get this result. Now in the following scenarios let’s apply the rule that higher returns are offset by a higher level of risk. Delivers a return of 20% per annum for 4 years equates to +107% total return. Impressive. Half of the companies fail whilst other have soared +27.35% p.a. an extremely positive result. Delivers a return of 30% per annum for 4 years equates to +180% total return. Average per year appeared to be 36.39% p.a. Impressive result! EIS case without income tax relief and Loss relief. Only Free Capital Gains on the investments. Not EIS. CGT 10% on the investments. Not EIS. CGT 28% on the investments. The first 2 scenrios with just 3 companies have been removed as their average income numbers are the same as in the case of 20 companies. It is the EIS Loss relief that enhances the return of the Risky Companies giving a better return than the lower risk companies. If you don’t use loss relief, the stable companies give the better results. So in conclusion, without the tax relief, specifically loss relief, you should be concentrating on lower risk investments because the risk reward ratio is better, but with EIS or SEIS relief, investing in low risk companies means that you are wasting a valuable tax relief by investing in a company which is low risk. Another result – that there is no big difference between 40% rate tax payer, 45% and even 30%. The numbers all are nearly the same. It does make sencse if you invest in SEIS or EIS and very big difference if you don’t use relief. You should not avoid risks when investing in EIS and SEIS. The tax system rewards you for taking risks and by using diversification you are able to dramatically enhance the risk reward ratio. As you see in all examples above even 50% income tax relief is not that significant compared to the growth results you can get from these investments. Choosing investments with more growth potential but individually higher risk of loss is better, because loss relief limits your downside. Dermot Campbell’s career as a wealth management professional has spanned 23 years across a range of disciplines, including management, private banking, financial planning, product specialisation and as an independent financial adviser. Dermot is a Chartered Financial Planner and a Chartered Fellow of CISI. Andrew Kartashov’s background is in IT having worked for a number of highly regarded IT companies in Moscow since the 1990s, and has developed various trading algorithms for investing on the Moscow Stock Exchange.